The ImageDisplay object as it appears in the Toolbox. The ImageDisplay object is used to display pictures to the subject. E-Prime 3.0 allows for image formats *.bmp, *.jpg, *.jpeg, *gif, *.png, *.tif, *.tiff, *.emf, *.wmf. The ImageDisplay is used to display a single picture at a time within the defined display area. The Slide object should be used to display multiple pictures simultaneously, or to display a combination of pictures and text. A new ImageDisplay object may be opened by clicking the ImageDisplay icon in the Toolbox, and dragging the object to the Workspace. 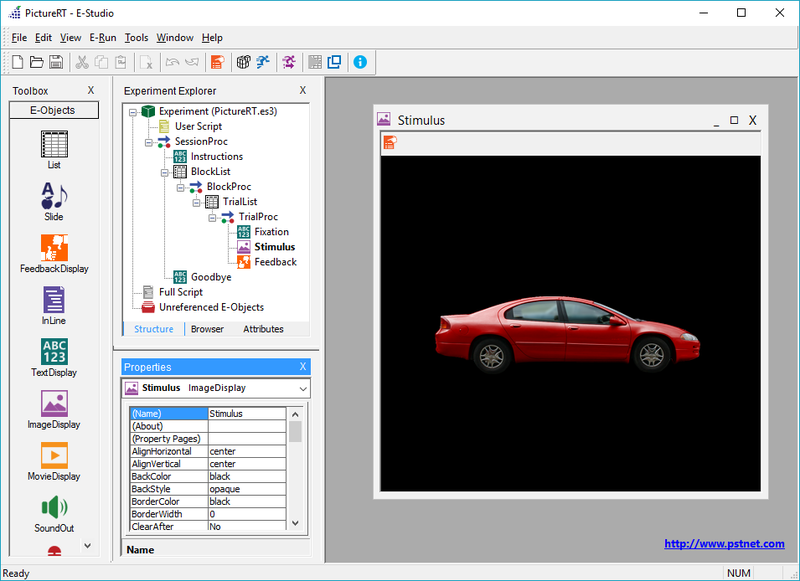 For existing ImageDisplay objects, clicking the object once with the mouse in the Structure view to select it will result in the display of that object’s properties in the Properties window. Double clicking an existing ImageDisplay in the Structure view will result in that object being opened in the Workspace, as well as the properties for that object being displayed in the Properties window. An ImageDisplay opened in the Workspace displays the name of the object, along with the ImageDisplay icon in the title bar at the top of the object window. Below the title bar, the toolbar lists the tool buttons associated with the ImageDisplay. Currently, the only active tool button is the Property Pages button. The Image window appears at the bottom of the ImageDisplay. The Image window displays the contents of the designated image file. 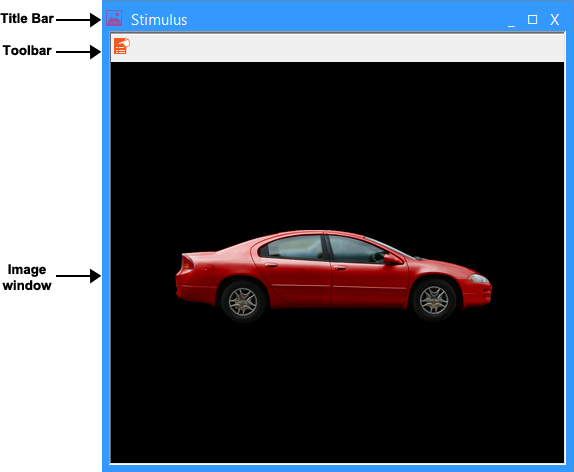 The ImageDisplay object is meant to simulate the display the subject will see during a run of the experiment. 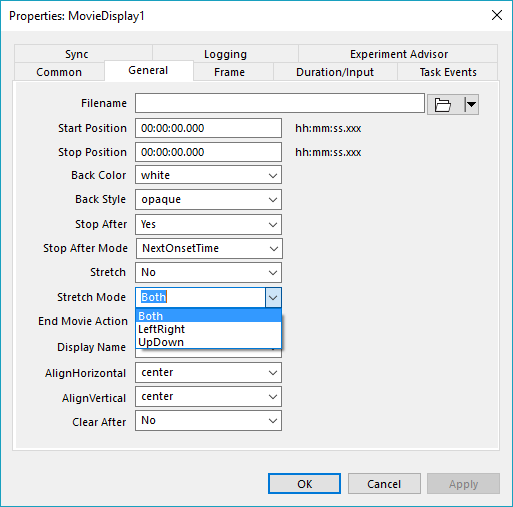 Using the Properties window or the Property pages, the properties of the display may be set. The setting of observable properties (i.e., BackColor, Alignment, etc.) will take effect immediately in the window of the ImageDisplay. The filename for the picture may be indicated directly in the ImageDisplay properties, or the bracket/attribute notation may be used to vary the picture to be displayed. The bracket/attribute notation indicates to E-Run that the information requested varies at runtime, and E-Run will look to the context to resolve the value of the attribute name in brackets. E-Studio will automatically use relative paths. If no path is specified, E-Run will look for files in the current directory, and an error will occur if the files cannot be located. To specify a filename outside of the current directory, a specific syntax must be used. E-Basic recognizes the backslash (“\”) character often used for path definition as an escape character. This character indicates to E-Basic that the first character following the backslash should be read as a special character. For example, within E-Basic, “\t” is read as a tab, while “\n” inserts a new line. When specifying a path/folder location for resource files, use of the forward slash is recommended. Refer to INFO: Use / for path separation for E-Objects with filename property . The properties for the ImageDisplay may be set using the Property pages. The Property pages may be displayed using the Property Pages tool button on the ImageDisplay toolbar, or by clicking the ellipsis (…) in the Property Pages field in the Properties window. The Property pages open by default to display the General tab. The General tab allows the specification of the picture to be displayed as well as the observable properties of that object (e.g., background color if the image does not fill the defined display area). Filename Strings, Attribute references Sets the name of the image to display. Note that variable and constant information can be concatenated (e.g., [filename].bmp, where [filename]is an attribute defined in a List object). Mirror Left/Right Yes, No, Attribute references. Designates whether the contents of a picture file should be flipped (i.e., turned over) along the horizontal axis. Mirror Up/Down Yes, No, Attribute references. Designates whether the contents of a picture file should be flipped (i.e., turned over) along the vertical axis. Stretch Yes, No, Attribute references. Designates whether the image should be stretched or reduced to fit the defined display area. StretchMode Both, LeftRight, UpDown Determines if the images is to be sized to accommodate the display area of the object. The aspect ratio can be stretched left to right, up to down, or both directions. AlignHorizontal Left, Center, Right, Attribute references Determines the horizontal alignment of the image within the defined display area. AlignVertical Top, Center, Bottom, Attribute references Determines the vertical alignment of the image within the defined display area. BackColor Color value (RGB values), Specific color strings (e.g., black, maroon, lime), Attribute references. The BackColor field allows the user to designate the color for the background in the ImageDisplay. If the picture does not fill the entire display area, the BackColor will fill in the remaining area. BackStyle Opaque, Transparent Designates the style of the background. In most cases, if using a common display area, the opaque backstyle will result in the removal of the previous display. A transparent backstyle results in an overlay of the current image over the previous display. 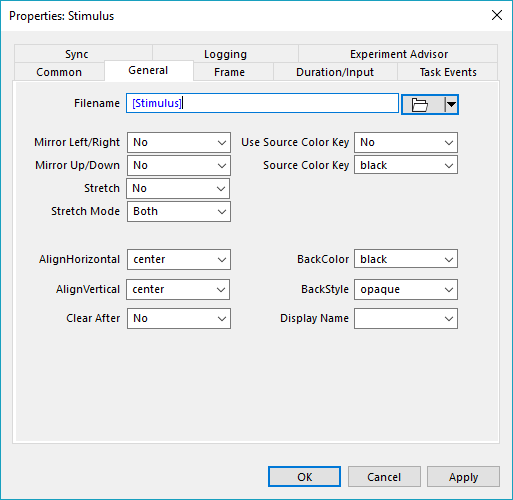 DisplayName Active Displays in the experiment Determines the Display the image is presented on. The Properties of the ImageDisplay may be set using the fields in the Properties window. (Name) String values Assigns a user-entered string as the name of the ImageDisplay. (About) --------- Displays the About ImageDisplay dialog. (Property Pages) --------- Opens the Property pages for the ImageDisplay. AlignHorizontal Left, Center, Right, Attribute references Defines the horizontal alignment of the contents within the defined frame (display area). AlignVertical Top, Center, Bottom, Attribute references Defines the vertical alignment of the contents within the defined frame (display area). BackColor Color value (RGB values), Specific color strings (e.g., black, maroon, lime), Attribute references. The background color on which to display the picture (i.e., if the picture does not take up the full area, the area behind the picture will be filled with the BackColor setting). Functionality depends on BackStyle property. BackStyle Opaque, Transparent, Attribute references Sets the style of the background for the display object. BorderColor Color value (RGBvalues), Specific color strings (e.g., black, maroon, lime), Attribute references. Sets the color of the border of the defined display area. BorderWidth Numeric values in pixels (e.g., "10"), Relative values (e.g., 10%), Attribute references. Reflects the size of the border of the display area. Duration -1 (forever), Numeric values (default in msec), Attribute references. Determines the duration of the object in milliseconds. Filename String values (e.g., Image.bmp), Attribute references. Designates the name of the file to load for display. Height Numeric values in pixels (e.g., "10"), Relative values (e.g., 10%), Attribute references. Sets the height of the display area. JumpLabel String values, Attribute references. Identifies a Label object within the current Procedure to which program execution jumps when input is received on a mask that has an End Action of “Jump”. LoadTimeStatsEnabled Yes, No Determines if the LoadTimes stats will be included in the ExperimentAdvisor experiment report. MirrorLeftRight Yes, No, Attribute references. Designates whether or not to flip the image horizontally. MirrorUpDown Yes, No, Attribute references. Designates whether or not to flip the image vertically. OnsetToOnsetStatsEnabled Yes, No Determines if the OnsetToOnset stats will be included in the ExperimentAdvisor experiment report. SourceColorKey Color value (RGB values), Specific color strings (e.g., black, maroon, lime), Attribute references. Specifies what color should be used as a mask to provide a transparent image. Tag String values, Attribute Defines a string value to be logged with the object. TimingMode Event, Cumulative, Custom Sets the timing method to be used by the object. Cumulative timing is used to absorb the processing time between events, and to maintain a certain interval duration between events or between trials. UseSourceColorKey Yes, No Determines if the SourceColorKey should be used when displaying the image. Width Numeric values in pixels (e.g., "10"), Relative values (e.g., 10%), Attribute references. Sets the width of the display area. Y Top, Center, Bottom, Numeric values in pixels (e.g., "10"), Relative values (e.g., 10%), Attribute references. Sets the Y-coordinate position for the anchor of the display area. E-Prime offers additional choices on how to render image and movie components when using the Stretch property. By offering the StretchMode property, an experiment author can choose to conform to the aspect ratio of the source image. The aspect ratio can be stretched left to right, up to down, or both directions. E-Prime supports the presentation of image files in multiple formats. Please take into account that compressed image files will require more cpu time and thus more PreRlease.